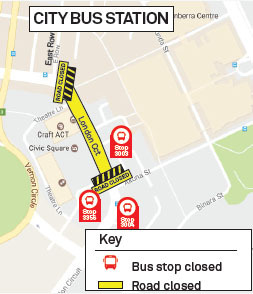 Passengers, please note that from Monday 29 April 2019, the Routes 842 and 843 will depart from Platform 5 at City Bus Interchange (Mort Street). Passengers, please note that from Good Friday (April 19th) through to Easter Monday (April 22nd), and on ANZAC Day (April 25), there will be temporary changes to existing Transborder services. Transborder wish to advise that our office hours are 8:00am to 5:00pm Monday to Friday. Our office will be closed on Public Holidays. Customers, please note that due to the Australia Day public holiday on Monday 28 January 2019, there will be no Transborder Express services operating. Customers, please note that from Christmas Day through to January 2 service times will vary on existing Transborder Express Services. From December 24 2018 to January 2 2019. Normal services will resume from Wednesday 2 January 2019. All School route numbers and names will be effective from Monday 3rd September 2018. The new numbers will ensure that school buses are easily identifiable. All new school bus numbers will start with a capital 'S' and be followed by a new 3 digit bus number, e.g. S100. View the Schedule of School Route Service Changes. Contact us by calling (02) 6299 3722 or contact us online to submit your enquiry. Ask for the Schedule of School Route Service Changes from your school office. Contact Transport for NSW directly on 131500. All regular route numbers and names will be updated effective from Monday 3rd September 2018. The new numbers will ensure that regular buses are easily identifiable. All new regular bus numbers will consist of 3 digits, e.g. 101. View the Schedule of Bus Route Service Changes below. 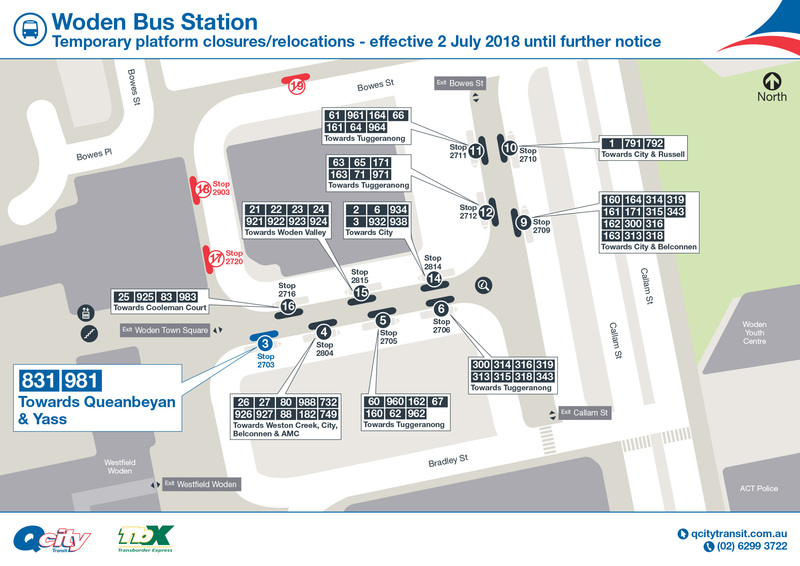 From Monday 2nd July 2018, due to construction at the Woden Bus Station, Route 831 will now depart from Platform 3 until further notice. We apologise for any inconvenience. Passengers, please note that from Good Friday (March 30) through to Easter Monday (April 2), and on ANZAC Day (April 25), there will be temporary changes to existing Transborder services. Commencing Monday, 5 March 2018, a new fare structure will be introduced on all Qcity Transit and Transborder services. Please note: Students who are currently eligible under the SSTS and transitioning from Year 2 to Year 3 or Year 6 to Year 7 at the same school campus will no longer need to re-apply, however, eligibility will be re-assessed by Transport for NSW to determine if the student is still eligible based on their residential distance from the school. Students who are changing campuses or schools will still need to reapply for the SSTS as normal. If you have any further questions about the SSTS or the eligibility requirements please contact the Qcity Transit School Services Coordinator on (02) 6299 3722 (option 1). Parents/care givers and students please be advised of the following change to the school bus service from Yass and Murrumbateman to several Canberra schools commencing Thursday 1st June 2017. Students who currently catch school bus 80 Emu from Yass, Barton Hwy and Murrumbateman in the morning and afternoon and transfer to 87 Possum from Hall will now be able to catch school bus 97 Kookaburra. School bus 97 will operate both morning and afternoon and travel direct to the schools listed below. Bus 97 will not service Hall Interchange in the mornings or afternoons. This proposal will operate as a trial service and is subject to scheduling variations as needs require. *All existing services will continue to operate as normal, including the Possum and Emu school services. *Bus 97 will not service Hall Interchange in the mornings or afternoons. *Bus 97 will not service Marist College in the mornings. If you require further information please do not hesitate to contact our SSTS team on 6299 3722. Parents/care givers and students please be advised of the following change to the #97 (Kookaburra) bus service commencing Monday, 17 July 2017. The #97 (Kookaburra) bus service is still operating as a trial service and will remain as such until the end of the school year, however, there has been a timing change on the departure times for this service from the Yass Interchange. Please note that there have not been any changes to the route for this service at this stage. Please also note: There are no proposed changes to the afternoon service. Parents/care givers and students please be advised of the following change to school bus services from Lyneham High School run 79 commencing Monday 1st May 2017. School run 79 will be replaced by new school run 77 and will depart from Lyneham High School at 3.18pm instead of the current time for run 79 of 3.38pm. Parents/care givers and students please be advised of the following changes to school bus services from Adastra bus stop commencing Monday 1st May 2017. Due to changes involving the servicing of Valencia Estate there will be changes in bus pickup times. The School bus runs 83, 89 and 77 are affected by this change. Please see changes below. Students traveling on our Qcity Transit and Transborder Express buses to and from school should now have their bus passes. As of Monday 27th March, our bus drivers will be asking to see a 2017 pass or proof of School Student Transport Scheme (SSTS) entitlement on boarding the bus. If you require a pass please don't hesitate to call us on 6299 3722! 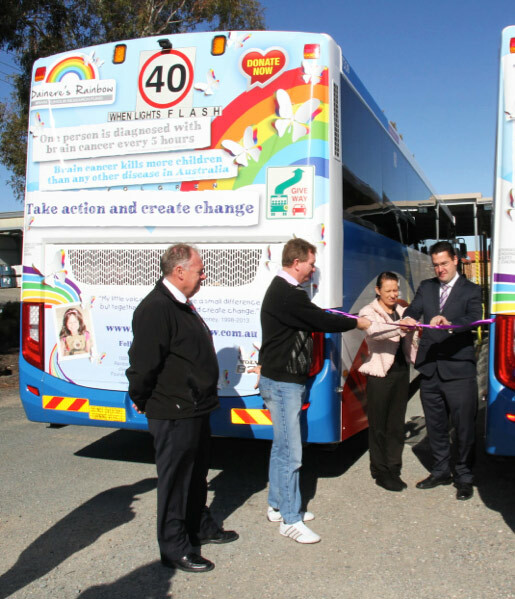 A campaign sponsored by Qcity Transit has been launched today by Senator for the ACT Zed Seselja to assist in creating vital awareness of Paediatric Brain Tumour Research and Funding across the wider Canberra and Queanbeyan regions. Left to right, QCity Transit Depot Manager Mr Steve Bushby, Stephen Anthoney, Yvonne Anthoney and Senator Zed Seselja who launched the two buses at 11am on Monday 27 July 2015 at the QCity bus depot in Queanbeyan. The Multicultural Festival will be held between the 17th to 19th of February, 2017. 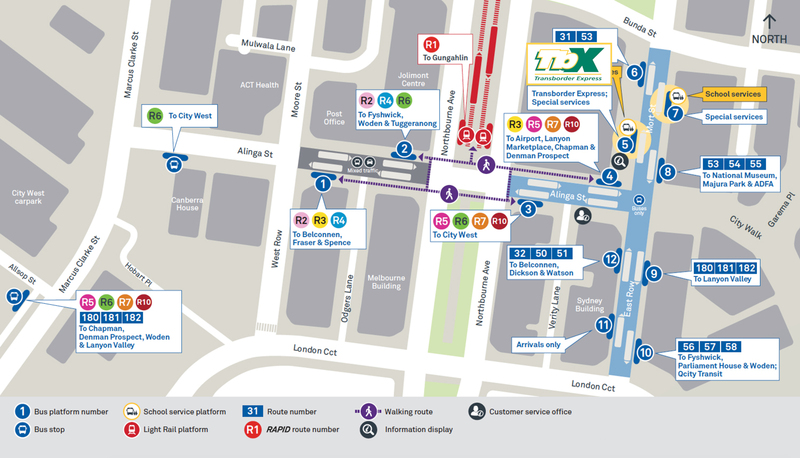 London Cct will be closed between Akuna St and East Row from 10am on Friday 17th of February. This will result in bus stop closures, and service diversions for the 981 on the Friday. Bus Stop 3004 (London Cct before Nangari St) and Bus Stop 3356 (London Cct outside Legislative Assembly) will not be serviced. If you use these bus stops, please plan ahead and make alternative arrangements during these times. The City Bus Station will not be affected during this time.